LAFD Capt. Eddie Marez instructs cadets at Banning High on how to operate a fire hose. Gail Sonoda (right), an instructor and firefighter with the Los Angeles Fire Department, teaches young cadets how to work a hydrant. "If we don't hire them as firefighters, we are going to develop better citizens," says LAFD Chief Ralph Terrazas. Clockwise from the top: Hoses piled neatly on a firetruck at Banning High School's firefighting program in Los Angeles; students line up for exercises; helmets stacked on the bumper of a fire truck. Students in the LAFD's new magnet school program race with fire hoses during a morning workout at Banning High. The students, dressed in blue T-shirts and shorts that say "LAFD Academy," try again in unison. Most students don't make it to 10. The morning workout at this school in LA's Wilmington neighborhood is part of two new LAFD magnet school programs. The department hopes to inspire future firefighters or emergency medical technicians — and recruit more women and minorities — in a department that remains nearly 97 percent male and about 50 percent white. Indeed, LA isn't alone. Nationally, the firefighting ranks are largely white and overwhelmingly male. "We provide a better level of service to the public when we walk into somebody's home for a medical call, and if they see a female or a Hispanic or an Asian person, they can connect with us better," says LA Fire Chief Ralph Terrazas. "It's not only a challenge for the Los Angeles Fire Department, it's a challenge for all fire departments: We are all competing to hire from a very small population of females," who want to join the profession. If you're trying to excite students about a career in firefighting or emergency response, it doesn't hurt to fire up Engine 38 and simulate battling a fire. In the parking lot near Banning High's football field, Marez barks: "Let's go ladies, let's put this fire out!" Jessica Melgoza, 14, and a friend get ready to let rip with a large fire hose. "You got about 100 pounds here between the two of you." "Oh, God!" Melgoza says, apprehensively. "You're gonna be just fine," the veteran fire captain cautions. "Open it up nice and slow." The girls tighten their grip on the hose. As the water shoots out they pull the large nozzle back slowly. "It felt awesome! This is something I've wanted to do for a while," Melgoza says after. "Pretty heavy. I think it weighs more than me!" Melgoza, a freshman, says she's interested in a career as a first responder. Maybe fire, maybe law enforcement. I ask her if she's concerned that it's a male-dominated field. "No," she says quickly. "There is a lady trying to become president now. No one thought that could happen. And I think girls have the same opportunity to do anything guys can do. I mean, we have a firefighter right here that's a woman!" She's talking about Gayle Sonoda, an instructor — and firefighter — here. "Something like this can be very empowering for young females," Sonoda says. It can build a foundation of confidence, she adds, "that they can do something guys can do, not only firefighting but anything else they set their minds to." 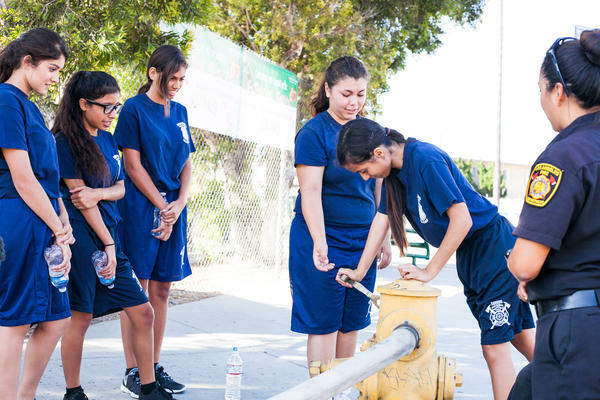 At Banning High, 21 of the 74 firefighter cadets are female. Across town at Wilson High — the other LAFD magnet program — one quarter are female. "OK, Who's next?" Sonoda asks a group of girls huddled around a fire hydrant for a lesson on how to use a hydrant wrench. "Who's the strongest here?" 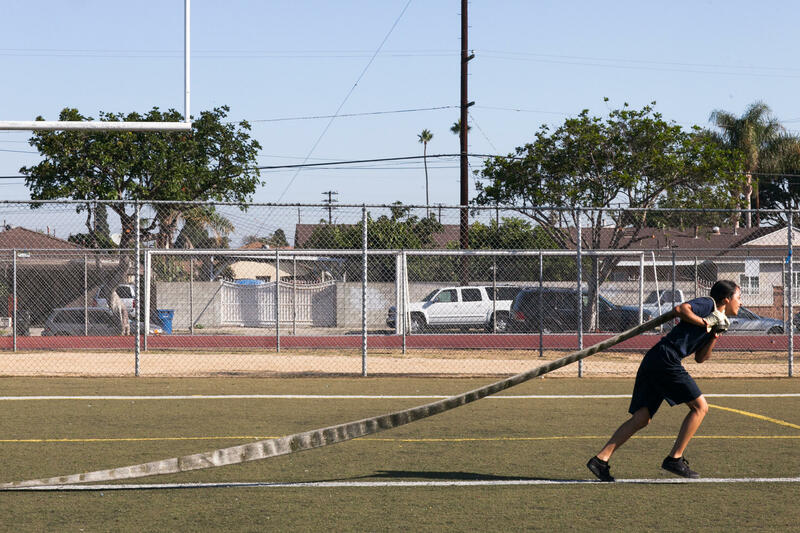 The instructors offer the sweaty students a tough-love mix of PE teacher and drill sergeant as groups race each other across the field carrying heavy fire hoses: "Run run run! Good job. Hustle up!" The workouts aren't for show. It's a huge part of this program which includes CPR, first aid, and fire science and technology classes, in addition to the regular high school curriculum. 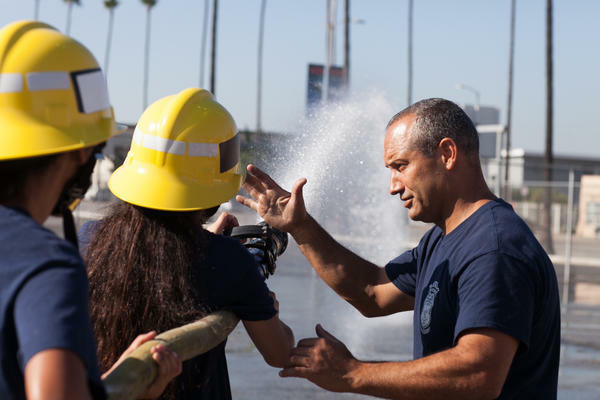 The fact is, Gayle Sonoda says, when adult recruits wash out of the LA fire academy – especially females – it's usually during the strenuous boot camp, where candidates have to wrestle ladders, tools, equipment and hoses, wearing full work gear during simulated fires. "The hands-on portion, it's a lot of skills involved," Sonoda explains. "And if they are able to be strong physically," then learning those skills early is important. The magnet program, "encourages me to do better in school, to stay focused" says 15-year-old Wendy Gomez. For now, anyway, she's determined to forge a career as a first responder. "If I become a firefighter I'll be the first one in my family. They're very supportive. [They] tell me, 'Don't give up.' "
Students in the program who may end up later trying to get into the department's training academy "are going to have a huge leg up on other candidates by knowing everything the way LA City does what they do," Capt. Marez says. "We're introducing tools and equipment, our department's organizations and our terminology." What's not clear is whether the program's academic quality will match the technical and physical sides. "The preliminary results show that the grades – across the board – have increased with these kids," says Chief Terrazas, "because they feel part of a team." The operative word there is preliminary. It's far too soon to tell. 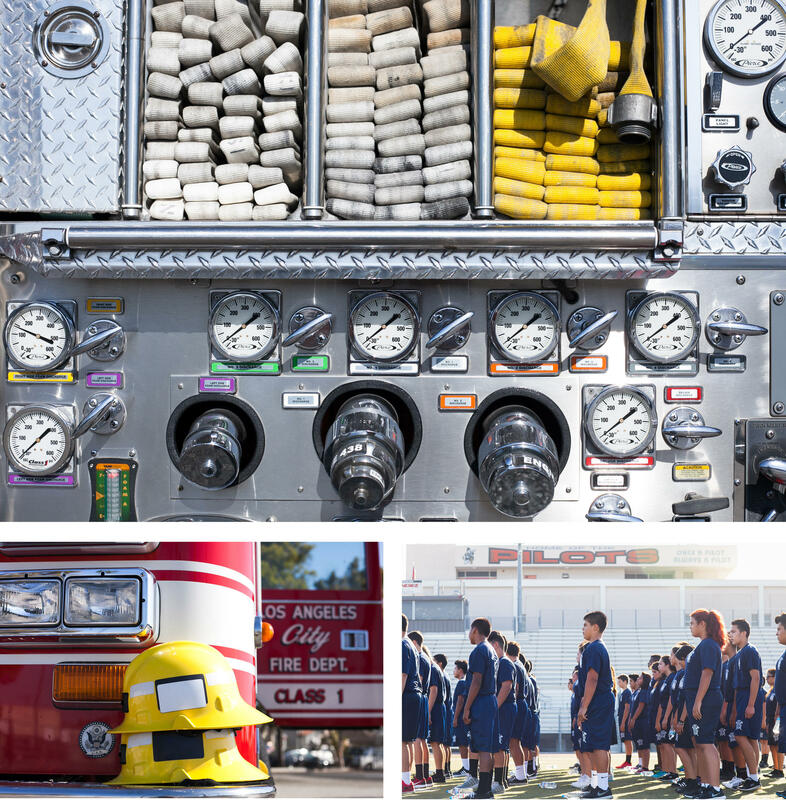 The LAFD's two magnet programs have only been up and running since August. Under California law, government agencies can't set hiring quotas for women and minorities. So Terrazas sees these fire magnet programs as key to boosting diversity in the ranks. He plans to add two more firefighting magnet programs next year. "My vision for the future is that we develop a feeder pool so that we can set (the students) on the right course for whatever they do life." Chief Terrazas knows that, in all likelihood, only a small percentage of these students are likely to end up as firefighters or EMTs. "But I look at the bigger picture," the chief adds. "If we don't hire them as firefighters, we are going to develop better citizens. We are going to help them, hopefully, pursue education. Go to college, the military. Whatever they decide to do." Firefighting in America has a diversity problem. Across the country, the profession is mostly white and male. In Los Angeles, nearly 97 percent of firefighters are men. So to try to recruit more women and minorities, the LA Fire Department is trying something new. This school year it opened to new firefighting magnet high schools. NPR's Eric Westervelt went to visit. UNIDENTIFIED MAN #1: One, two, three, four, five. Good. 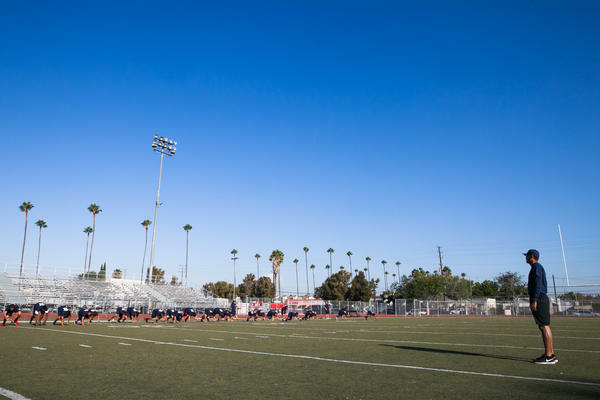 ERIC WESTERVELT, BYLINE: No first period for the 70-plus students at Banning High's firefighting magnet school in south LA. It doesn't start with a slide down the fire pole, but a sprint across the football field carrying heavy fire hose - you bet. UNIDENTIFIED MAN #2: Yeah. Let's go. WESTERVELT: The 9th and 10th graders in this magnet-school-within-a-school tear across the sun-toasted, artificial turf, dragging heavy hose line. They all wear the same blue gym shorts and T-shirts emblazoned with the words LA Fire Department Academy. EDDIE MAREZ: Good job. Good job. Hustle up. Hustle up. Let's go. Let's go. Hustle up. Here we go. Come on. WESTERVELT: Captain Eddie Marez, who's in charge of LA's two new firefighter magnet schools, offers the sweaty students a tough-love mix of P.E. teacher and drill sergeant. UNIDENTIFIED STUDENTS: One, sir. One, sir. MAREZ: Didn't say up yet. Start all over. Down. WESTERVELT: On this recent early morning, Marez isn't thrilled with the floppy butts and arms during the push-up drills. WESTERVELT: The rigorous three-days-a-week workouts aren't for show. Exercise is a big part of this program, which includes some fire science classes, in addition to the high school's regular core curriculum. The fact is, says firefighter and school instructor Gail Sonoda, when adult recruits wipeout of the LA Fire Academy, especially females, it's usually during the strenuous boot camp where candidates have to move heavy ladders, equipment, tools and hoses in simulated fires in full fire gear. GAYLE SONODA: The hands-on portion - it's a lot of skills involved. And if they're able to be strong physically and the skills - learning them early on come in handy. WESTERVELT: And if you're trying to excite students about a career in firefighting, it doesn't hurt to fire up Engine 38 and simulate battling a fire. UNIDENTIFIED MAN #3: Let's go, ladies. Put this fire out. WESTERVELT: Fourteen-year-old Jessica Melgoza and her friend - two small girls - get ready to let rip with a big fire hose. MAREZ: We're going to open it up. OK. We've got about a hundred pounds here between the two of you. JESSICA MELGOZA: Oh, God (laughter). Oh, God. MAREZ: You two are going to be just fine, OK? Open it up nice and slow. MAREZ: There. More, more - right there - all the way. JESSICA: It felt awesome. This is something I've been wanting to do for a while. It's really heavy. I think it weighs more than me. RALPH TERRAZAS: The grades across the board have increased with these kids. WESTERVELT: That's LA Fire Chief Ralph Terrazas. Under California law, government agencies can't set hiring quotas for women and minorities. So Terrazas sees these high school magnet programs - two open this fall, and two more are scheduled for next year - as key to boosting diversity in the ranks. Yet he knows only a small percentage of these students are likely to end up as firefighters or EMTs. TERRAZAS: Five to 10 percent is a realistic number, but I look at the bigger picture. If we don't hire them as firefighters, we're going to develop better citizens. We're going to help them, hopefully, pursue education, go to college, whatever they decide to do - the military. WESTERVELT: Jessica Melgoza, a freshman, tells me she's pretty sure firefighting is the career for her. And she's not worried, she tells me, that it's a male-dominated field. JESSICA: No. There's a lady trying to become president. No one thought that could happen. And I think girls have the same opportunity to do anything guys can do. I mean, we have a firefighter right here that's a woman. SONODA: So I want you to make sure this is as tight as it can get. WESTERVELT: That woman right here, Gayle Sonoda, tells me later even if few of the 21 girls in this magnet school make firefighting a career, maybe, quote, "I've helped give them a foundation of confidence." Eric Westervelt, NPR News, Los Angeles. Transcript provided by NPR, Copyright NPR.